A couple of years ago our kids bought us a George Foreman Grill for Christmas. When we opened up the present Mike wasn’t quite sure if he would like it, but I was thrilled. I had wanted a George Foreman Grill for some time. Once we used it, Mike fell in love with cooking on this grill; needless to say, I don’t usually do much cooking on it. I do have to say that I love the food that comes off the grill, though. Also, I know that it is somewhat healthier than frying the same food. One of our favorite food items to make on this grill is salmon. Normally we have the salmon with a little lemon juice along with some Mrs. Dash (the original version). It is very tasty made this way, but I thought it would be a good thing to change things up a little bit. The recipe I found was actually called Basil-Buttered Steaks. 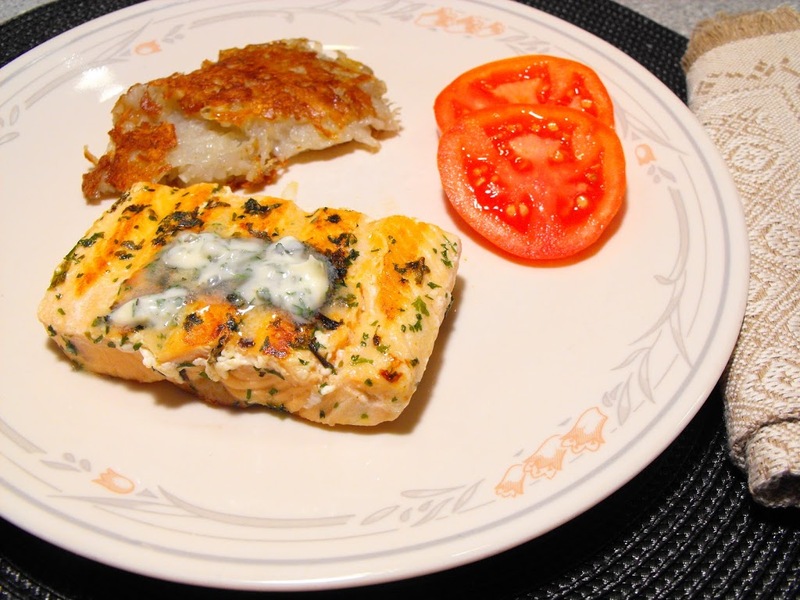 I found this recipe in a book called Better Homes and Gardens Fresh Fish Cook Book. It called for halibut, salmon, shark, or swordfish steaks. I had salmon in the freezer, not the steak variety just smaller slices of salmon. Which worked just fine. The salmon was moist and flavorful. The herb butter that was used to baste and garnish the salmon was a snap to make and oh so tasty. I know that I will be using this recipe for a long time to come. The fish was cooked on our George Foreman Grill, but the recipe called to have it prepared under a broiler or on an outdoor grill. Even though the dollop of Basil-Butter looks thin and runny on this picture, it was very creamy and thick. I didn’t take the time to cool the salmon when putting the butter on it, so it started to melt. The salmon looked and smelled so delicious we couldn’t wait to eat. 1. For butter mixture, in a small mixing bowl combine butter, basil, parsley, and lemon juice. Mix till well blended. 2. Place the fish on a greased rack of an unheated broiler pan. Lightly brush fish with some of the butter mixtures. Broil 4 inches from the heat for 5 minutes. Then using a wide spatula, carefully turn fish over. Lightly brush with more of the butter mixture. Broil for 3 to 7 minutes more or till fish is done. 3. To serve, dollop remaining butter mixture on top of fish. Makes 4 servings. To grill: Prepare Basil-Butter Steaks as directed above, except brush grill rack with cooking oil. Place fish on rack. Lightly brush fish with butter mixture. Grill fish on an uncovered grill directly over medium-hot coals for 5 minutes carefully turn fish over. Lightly brush with more butter mixture and grill for 3 to 7 minutes more or till fish is done. Dollop remaining butter mixture on top of fish. For George Foreman Grill: Prepare Basil-Butter as directed above. Heat George Foreman Grill until heated and the light turns off. Brush grill with virgin olive oil. 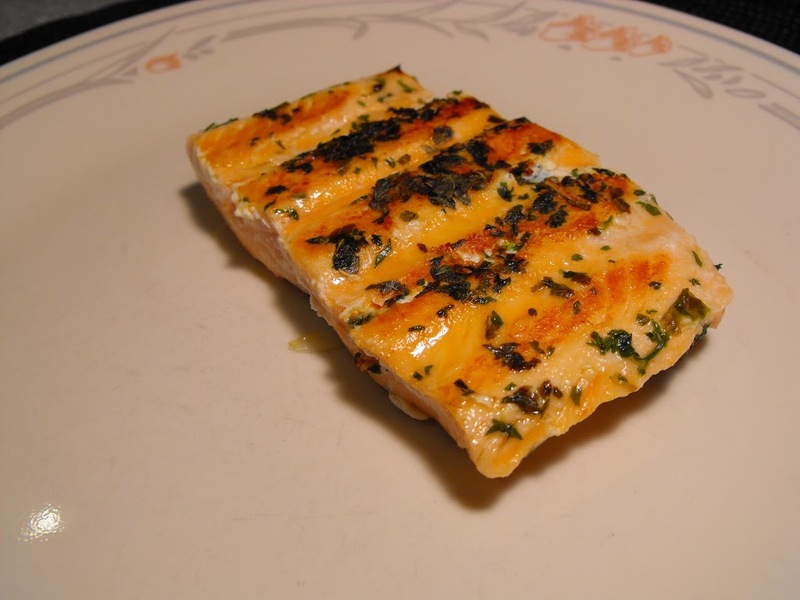 Brush salmon with the Butter-Basil and place that side on the grill. Once the salmon is on grill brush the top of the salmon with the Butter-Basil as well. Our pieces of salmon were about a 1/4 pound each and were grilled 4 to 6 minutes. Time will vary with the size of fish you are preparing. 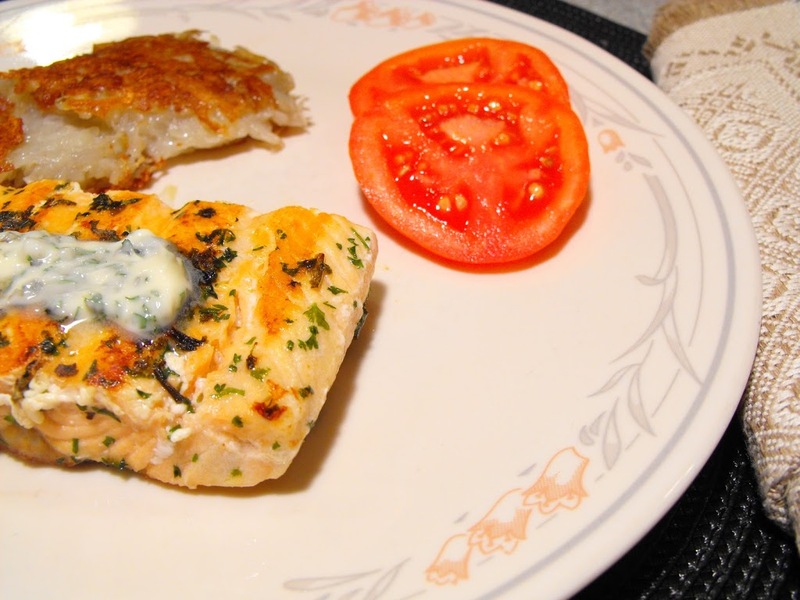 The salmon steak looks so fresh and mouthwatering! I love my George grill too! Your salmon looks delicious with that herby melting butter over top! I bet the salmon was extra delicious with the basil butter – yum!